Smart Tech Overview The Process EON Overview What can EON do for you ? 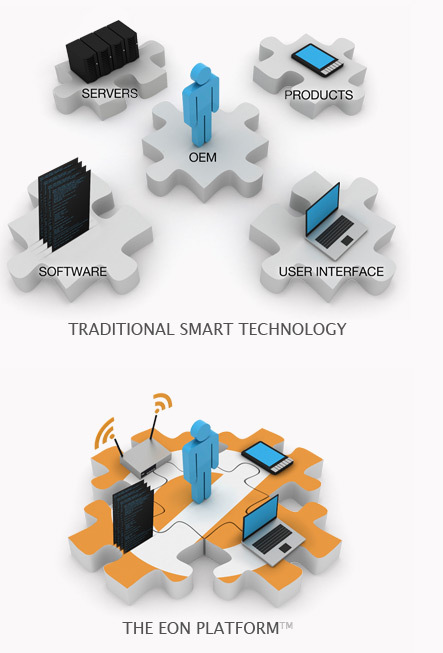 Smart applications use wireless sensor network (WSN), machine-to-machine (M2M), Internet Protocol v6 (IPv6) or similar technologies to give IP-addresses to real-world objects, which allows them to collect and transmit information about their condition or environment via the Internet – making the objects “smart.” Remote access and control of smart objects can be achieved via a web page or Smartphone. In the past, smart objects have mostly been used in defense and industrial related applications because of the high cost of development and implementation. However, recent technological advancements are lowering adoption costs and are opening the door to limitless possible solutions in commercial and consumer applications as well. This means that remotely monitoring anything from the health of a pallet of rare orchids to the vital signs of a medical patient, or controlling the position of a field of reflecting mirrors to a single solar collector is now possible – all with the convenience of your computer or Smartphone. The market for WSN, M2M and IPv6 technologies that make these “smart” innovations possible is expected to grow rapidly over the next 10 years, with annual revenues projected to reach $5-7 billion during that time. Evidence of this growth can be seen by watching the exciting new trend called the Internet of Things – a network of Internet-enabled objects, together with web services that interact with these objects. With large companies such as IBM and associations like the Internet Protocol for Smart Objects (IPSO) Alliance (formed by Cisco and Sun) leading the way, the future of smart technology is wide open. As ON World has stated, 66% of the billions in annual revenue expected over the next 5 years will come from pent-up demand – users who want smart devices today but for which no product exists because Original Equipment Manufacturers (OEMs) lack the technological expertise to bring them to market. As we continue to develop easy-to-use and cost-effective technology solutions for OEMs like you, these smart products will quickly begin to come to market. As a result, the new data available to your customers about their smart objects will impact decisions and actions across all industries. Data will move beyond visualization and become an active member of the boardroom and the household.